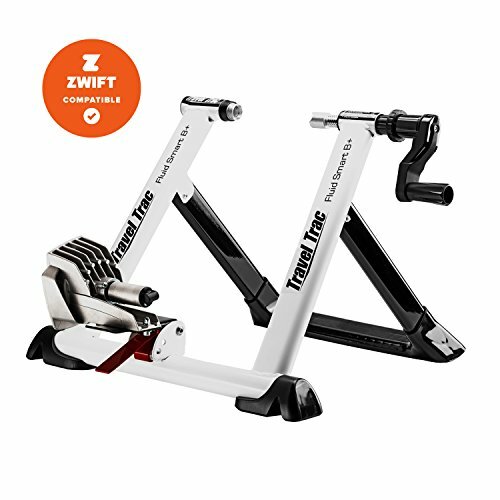 The Travel Trac Fluid Smart Trainer has an advanced fluid resistance unit with a cutting-edge frame design and Fast Fixing bike mount system that work together to simulate the road when training indoors. The Travel Trac frame is extremely strong and stability at high speeds and adapts to all wheel sizes from 20" to 29" and the Fast Fixing clamping system allows clamping and releasing of the bike with a single hand. This unit integrates perfectly with the included Misuro Blu+ Power and Cadence/Speed sensors, which let you track your training stats on a Smartphone or tablet. Cycling stats from the Travel Trac Fluid Smart can be broadcast via ANT+ your Smartphone or Apple device, to manage power, pedal cadence, heart rate, speed, time and distance, plus map races, create training programs, and more. The best part? This trainer is compatible with the Zwift Virtual Powercurve when used with an ANT+ speed/cadence sensorFeatures: Advanced fluid resistance unit Super quiet with perfectly smooth pedaling Strong and stable frame Aluminum roller Fast-fixing bike mounting system Misuro Blu+ Power and Speed & Cadence sensor included Compatible with Zwift Virtual Powercurve when used with an ANT+ speed/cadence sensor. If you have any questions about this product by Travel Trac, contact us by completing and submitting the form below. If you are looking for a specif part number, please include it with your message.